Bri Ribaj: Manny Takes Fertility Drugs? 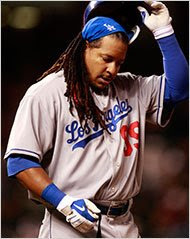 Could somebody explain to me why Manny Ramirez is taking fertility drugs? Is this something that's in the vernacular that I, for some reason, missed? Men take fertility drugs? Hm. "“Unfortunately, the medication was banned under our drug policy,” Ramirez said in the statement, which was released by the players union. “Under the policy that mistake is now my responsibility. I have been advised not to say anything more for now. I do want to say one other thing: I’ve taken and passed about 15 drug tests over the past 5 seasons.”"
It's ridiculous what these guys take. I suppose that's what happens why athletes are overpaid. They have to find ways to surpass their natural talent. I wonder what effect this drug has on his body. Have you noticed how the media is playing up his 'unique' look? It's really funny how these guys are never aware of what they're taking. Well, he's taking it to boost his testosterone levels, which presumably could enhance his performance. On the field, I mean. All this artificial enhancing, whatever happened to good ol' hard work and talent? High expectations are often problematic, for sure. Being the best at any cost is not being the best. The fans don't appreciate being lied to.